Once the lift opened, Kurei released his flame. Recca counter reacted Kurei’s approaching flame. Unfortunately, Kurei proved to be stronger than him as the impact of the 2 flames sent Recca slamming to the wall of the lift. However, Kurei’s flame was put out during the process. Recca believed that they were even and demanded for Yanagi's release. Kurei laughed at Recca' naivety and pointed to the scar that Recca had on his face. He told him that the scar on his face had confirmed his story of their relation to the Hokages Ninja because he was the one who had made the scar. He went on saying that Recca had very little knowledge about his flame and explained to him that the next fearsome thing about the Hokages besides their maudough was their flame caster. Being able to create flame was a skill that very few people were capable of and so, it was usually passed down to father and son. Usually, the one with the power of the flame would become the leader of the Hokages. The power of Kurei’s and Recca’s were totally different because the type of flames (size, shape and colour) would be reflected on the mind of the flamecasters. 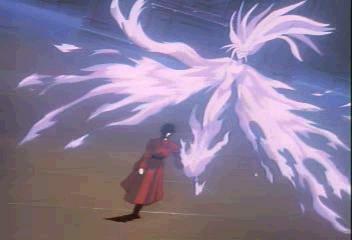 To prove his point, Kurei released his own flame – a fiery angel (who couldn’t stop howling) named Kurenai. The angel demonstrated her power as she attacked them fiercely. Then, Kurei turned his attention on Ganko. Domon tried to protect her but gets blown away by Kurenai. Kurei mercilessly told Ganko that her death was going to be a quick and she would unit with her mother soon. She was about to be turn in ashes when Recca stepped in, refusing to be intimidated by cold-hearted, despicable person who killed women and children. Fuko (encouraged by Recca) joined in and used Fujin on Kurenai, Domon threw a piece of concrete at her, Mikagami (appearing from nowhere) sliced her with Ensui and Recca made the final blow. Kurenai vanished but soon re-appear. Kurei mocked at their stupidity. Kurenai would kept on reappearing as long as Kurei lives. The hot-tempered Recca launched forward but was pulled back by Mikagami. He yelled at him for interfering. Mikagami explained that he was being rash and they should have a plan. He suggested the four of them attack Kurei instead of Kurenai because he was the one controlling her. Recca didn't like the idea of four against one, which Mikagami instantly rebut by saying they were not playing a game and being fair does not count. If Recca die, who would be able to save Yanagi. Once the four of them had agreed, they shattered to attack. Kurei approved of Mikagami’s theory and allowed Kurenai to attack anyone she please. She chose Recca. Fuko, Domon and Mikagami faced Kurei, who knocked them out one by one, saying that since Kurenai had chosen Recca, he must be the strongest of them. Recca collapsed from Kurenai’s severe attack. Kurenai was ordered to burn them to ashes when Recca gets up. Kurei was surprised that he was able to stand up after such an attack. Kage Houshi appeared and justified Recca’s ability to do so because flame casters had the ability to endure the burning magnitude of the flames. 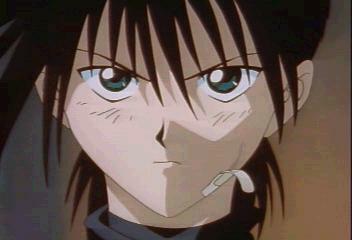 In addition, Recca's will to protect Yanagi gave him the strength to continue fighting. Seeing the situation, Kage Houshi advised Recca to withdrawn but he insisted to stay on and fight. She then told him if he’s willing to gamble with his life, he had to take off his cast on his right arm as it will unleash the actual magnitude of his flame. She also explained that the cast was meant to protect him from being burnt to death from his own flame. Recca finally understanding the purpose of him wearing the cast since the day he could remember. Without hesitation, he took the cast off. However, Recca was not prepared for the pain that he would endure as his powers were unleashed.